When Randy Blythe's incarceration in a Czech prison forced Lamb of God to cancel summer tour dates, In Flames were happily announced as their Heavy T.O. replacement. 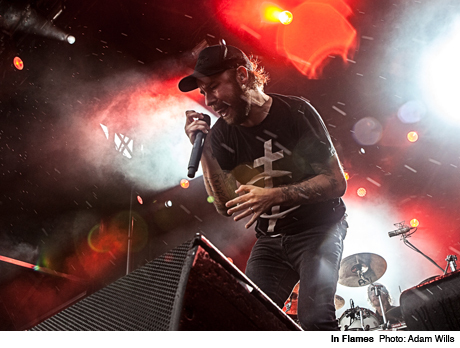 Frontman Anders Fridén mentioned that fact when he told the crowd this trip to Canada had interrupted his vacation, then refused to play any Lamb of God covers (this would be "too easy," he joked). The Swedes performed for slightly less than their allotted hour, focusing mainly on their more recent albums (from Clayman's "Only for the Weak" to songs from last year's Sounds of a Playground Fading). With his droopy skinny-legged jeans, Fridén looked a bit like an old man from a distance, leaving most of the rocking out to his greying bandmates, but he (and they) sounded as good as ever. In Flames finished their set with a dedication to late local metal celebrity Rob Cranny, playing "Take This Life" in his honour.